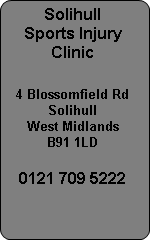 Solihull Riding Club is a stones throw from Solihull Sports Injury Clinic. Horse riding can often be the cause of many injuries. These range from minor sprains, bumps and bruises from falls right through to fractures and serious head injuries in some cases. A horse is a very large animal of considerable weight and if it falls on top of you then serious injuries may result. For most of us who ride, we collect only minor injuries and more often back pain from "mucking out" the stables and yard work. Solihull Riding Club is a local riding club who could benefit from using the Solihull Sports Injury Clinic facilities.